Within a span of a few pages, Tyson narrates the expansion of the universe from an infinitesimal dot to a few light-years in size. It’s a billion degrees, and electrons are popping in and out of existence before being annihilated in a sea of photons. Why? I don’t know. But I’m in a hurry, remember? I probably don’t need to know. After reaching the two-minute mark, Tyson tells us that nothing much happens for 580,000 years. A billion years pass during which the universe expands and cools, and galaxies, stars and planets are formed. Shortly thereafter, in Earth’s oceans, simple anaerobic bacteria emerge and excrete a bunch of oxygen into the atmosphere. A whole bunch. Enough to give rise to aerobic life and form the ozone layer in the Earth’s atmosphere. From the Big Bang to life on Earth in 18 pages – Astrophysics for People in a Hurry is living up to its promise. 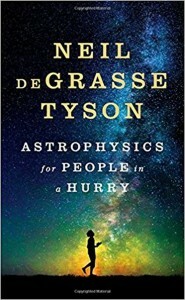 After hurriedly deconstructing the Big Bang, Tyson dives into a seemingly random assortment of facts and ideas about the universe – its physical laws, the electromagnetic spectrum, and even a chapter entitled “On Being Round,” which is about why the sphere is the universe’s favorite shape. Two of the most interesting of these chapters are those on dark matter and dark energy. Tyson calls dark matter our “strange, invisible friend.” After having calculated the amount of matter in the universe, scientists measured the amount of gravity and learned that there was six times as much gravity than would be produced by the matter they could see. In order to account for this discrepancy, scientists have chosen to create the notion of dark matter – extra matter that we can’t perceive but, based upon the amount of gravity being produced, must be there. Dark energy is similarly theoretical and equally unsatisfying. It’s what, in Star Trek, would have been called anti-gravity and is a theoretical force posited to explain the expanding universe. Quiz time! There are 118 elements in the periodic table of the elements. How many of them were formed in the Big Bang? The answer is three: hydrogen, helium and lithium. All of the others were forged within stars and then exploded throughout the universe. And finally, a timely fun fact: Our solar eclipses are unique because our moon, whose diameter is one four-hundredth the length of the sun’s diameter, is also 400 times closer, making them appear (roughly) the same size to us in the night sky. Tyson’s book is chock full of goodies like this, and they are exactly the kind of anecdotal tidbits that make Astrophysics for People in a Hurry fun to read. With sentences like “Nobody doesn’t like intergalactic space,” Tyson’s is not a particularly well-written book, and those inclined toward YouTube might seek out Tyson’s talks on the same topics there. 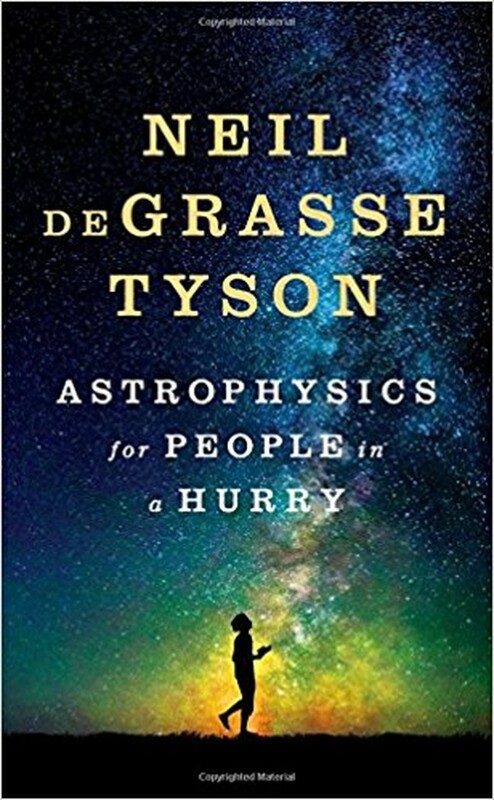 Astrophysics for People in a Hurry is broad smattering of facts about the universe that will, at the very least, be useful at social gatherings. Drop your ideas about dark matter in the middle of a conversation, turn, and walk quickly away.